It’s one minute to eight in the evening on Thursday, November 18th, 2010, and yet again, I split off from the conversation for a moment to stand on the balcony. It’s not that the conversation bores me, quite the reverse. But the city lights are spread out below, around and even above me–from this fourteenth floor–in the night, a coal face full of diamonds. To the east, the sea is dark, but the white lines of foam shine through as they slide to the shore. So, it’s three in the afternoon on Thursday, and I’m sitting opposite Scarlett and Morgan, and next to a pram. 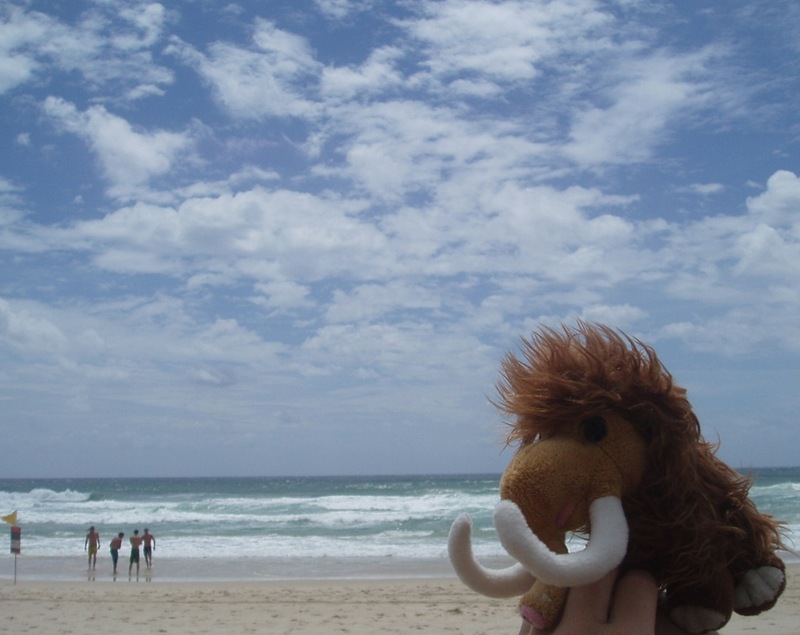 We’re headed south, to spend two nights in Surfers (not Surfer’s) Paradise, on the Queensland Gold Coast. Morgan, Scarlett and I, that is, not the pram. But we do have reinforcements coming; first Thomas, and then Emil will join us on later trains. And we have a mammoth, called Ray Romano. So, it’s shortly after midday on Friday, November 19th, and I’m cracking eleven eggs inefficiently into a plastic jug. Breakfast. Morgan is taking care of the pancakes. So, it’s nine at night on Thursday, and we all five are wearing black, taking to the streets of Surfers. It’s perfectly dark. Thomas, Emil and I are wearing shades. Naturally. So, it’s early afternoon on Saturday, November 20, and I’m walking out of a shop wearing a red baseball cap that I’ve completely forgotten I tried on. Crime. By universal consent, I look like a redneck called Zeke. So, it’s the early hours of Friday morning, and I’m taking another happy glance out from that balcony. Not for long, though. A moment is enough, and it’s not as though I need my mood lifting. I bounce back inside, and lapse back into the chair around the small table where cards lie scattered, clumped into piles like cliques in a playground. A small pair of speakers blast Eminem, or Journey, or one of those Linkin Park/Jay Z mash-ups. Somebody’s ignoring the game to bust a move. Whose turn. And this is how I spent the last two days. Scarlett booked a two-person hotel suite (kitchen, bedroom, etc), which we promptly filled with five people. Crime. We travelled down, bought essentials (eggs, pancake mix, rum, Coke, jumbo marshmallows), and unleashed ourselves on Surfers. It was fantastic. 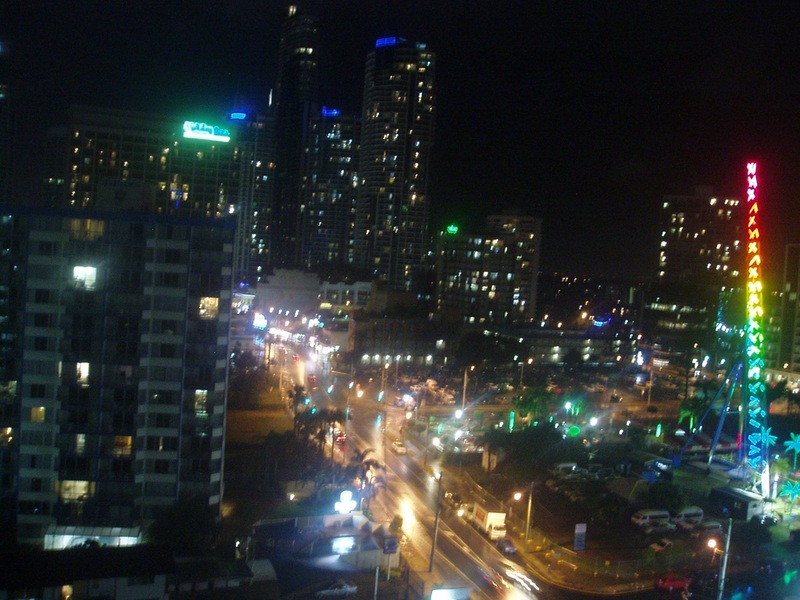 Surfers Paradise on the Gold Coast. 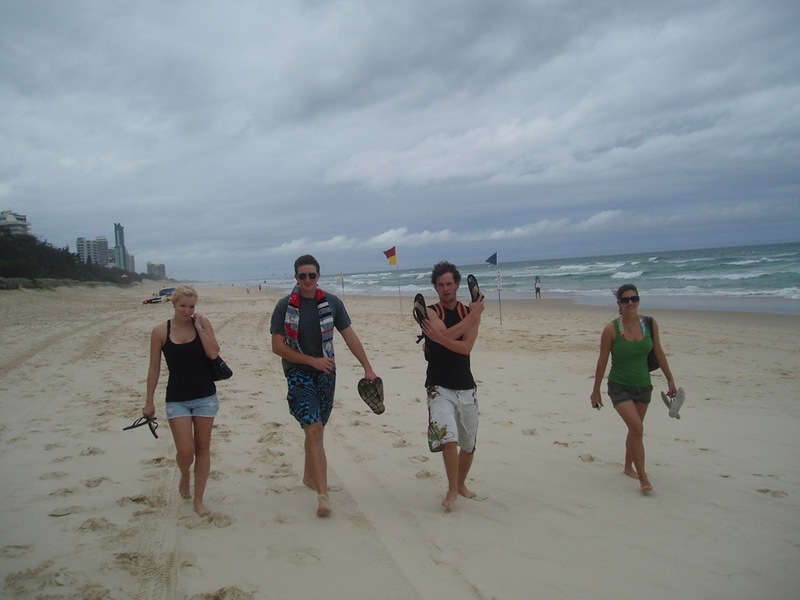 Surfers Paradise on the Gold Coast of Australia, bright Las Vegas lights, the huge sweep on the Pacific Ocean majestic to the East beyond a broad beach of golden sand, and an Australian rarity; places other than 7-11 convenience stores open after 6pm. Further incoherent praise. I really couldn’t have asked for more, a cooler location or better companions. It only lacked in not giving us any real beach weather to top the whole thing off; the overcast weather lifted on Saturday morning, but brisk winds whisked stinging sand across the beach far too often to make lying around comfortable. Everything else was awesome; train trips and Irish bars, being taught the art of s’mores by the North Americans (Morgan and Thomas are Americans, Scarlett Canadian. Emil is Danish and likes sleeping under the stars. He is also very good at not rising to my casual racism) using koala-shaped biscuits over the kitchen hob. Bonding with Ray Romano, our therapy mammoth. Creating “light graffiti” using glowsticks and the long-exposure setting on Emil’s epic camera (pictures no doubt to follow). Hitting up the Surfers nightlife in the modestly-titled Sin City nightclub. Sitting on the beach with Emil in the middle of the night after deciding that we had to leave the hotel room and sprint into the ocean (we saw a penguin, and I don’t care who says otherwise). It was… I’m pretty certain it was what I came on this exchange year for. Whetted my appetite for the rest of my travels, kicking off with a flight to Adelaide next Sunday and then leading I have no idea where? Yes. Oh, Christ yes. So, it’s 8.45 AM, on Friday, November 19th, 2010. I’m just about as content as it’s possible to be. Emil’s sleeping on the balcony, but I step quietly past him occasionally to go and enjoy that view in the morning light. The horizon beyond the ocean is further away than anything has ever been. I step back inside, pick up my notebook. I’m drawing a picture, with lots of little trees. And I have a tin pot of tea and a bag of Doritos (they’re basically spicy cornflakes, right?) to see me through until pancake time. The deck of cards, for patience. A Murakami novel that Emil left lying on the table. I’ve already cleaned up, the beer bottles and crisp packets, something which always makes me feel tranquil. Other people will wake up soon, and we’ll kick off all over again. Wander the streets, people watch, souvenir shop, buy noodles. The day won’t end until Emil turns off his Tom Waits album around 4AM. I could live like this for a while. You can hear the ocean, even from inside the hotel. So, it’s Sunday morning, November 21st, 2010. I still have sand in my hair. This makes me incredibly nostalgic… and we only got back yesterday. “Casual racism”?! I vaguely remember you being vehemently opposed to anything of the sort last summer in Edinbugh! Also, I told you all about the magic of the S’more years ago! The Paianos sent us Smore Xmas decorations years ago which I needed to explain… Although I’m sure the experience of them brought the image to life very well indeed. I like the shoe pose, though. The show pose is very cool. I like the shoe pose, though. The shoe pose is very cool. By casual racism I mostly mean calling him “Hamlet” in the hope of provoking him into making Irish jokes back at me, but he proved far too nice.